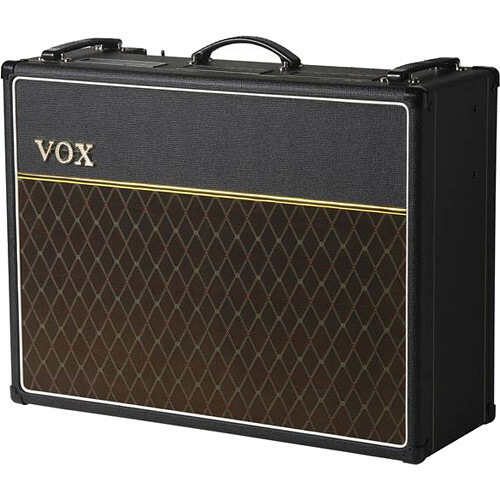 Designed for use with electric guitars, the AC15C2 Custom Twin from VOX is a 15W RMS combo amplifier sporting a 2x12" cabinet comprised of Celestion G12M Greenback speakers. The amp also boasts a tube-driven preamp, a tube-driven power-amp stage, and two independent channels: Normal and Top Boost. The Top Boost channel offers access to an interactive EQ section—interactive in that the treble knob affects levels of bass and vice-versa—while the Normal channel provides a clearer signal path. Whichever channel you choose, the Tone Cut knob across the power-amp stage gives you even more control over your signal's high-end. Also, you can apply the onboard tremolo and reverb to both channels; both of these effects can be toggled via footswitch (available separately). Turn your attention to the back of the amplifier and you'll see a 1/4" extension jack for powering an extra 16 Ohm speaker, as well as a 1/4" external speaker output. The external speaker jack can power both 8-Ohm and 16-Ohm cabinets, so long as you set the impedance switch accordingly. You'll also notice a footswitch input through which you can toggle reverb and tremolo with the tap of your toes. Speaker Through/Output 2 x 1/4"